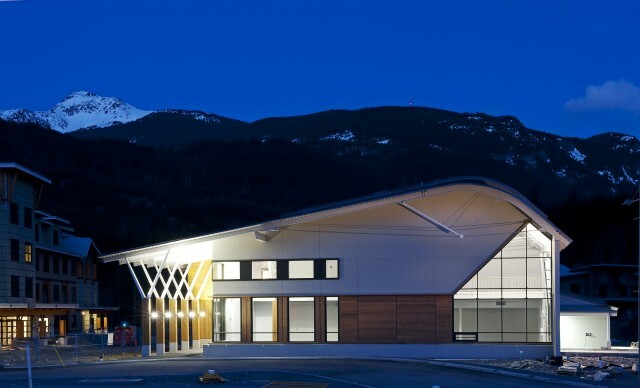 The Whistler Athletes High Performance Centre is a two story, 1862 sq m. facility that is part of a larger development encompasses the Athletes Village (including Athlete Accommodations) and future sport fields. The facility is comprised mostly of offices, classrooms, a fitness area, and a gymnasium. As part of the Vancouver Organizing Committee’s Sustainability commitments, the Centre was required to achieve LEED Silver certification, which it did. Sustainable Sites: The Center as part of the Athletesâ€™ Village is located near a decommissioned landfill site. The site includes the Centre, the parking lot that serves the facility and the adjacent knoll. When the Village is complete, residents and visitors will be serviced by a local transit system. The Centre provides bike areas as well as shower facilities for cyclists. Water Efficiency: The Centre uses high efficiency irrigation for irrigation and reduces the amount of potable water used by almost 50%. Energy & Atmosphere: Overall the building saves approximately 43% of energy and reduces 41.9 tons of CO2 per year compared to the reference case. The main floor spaces including Entry Lobby, Change Rooms and Multi-purpose Room are served by a radiant slab heating and cooling system. To further offset CO2 VANOC is committed to purchasing Green Power Certificates equivalent to 100% of the buildings electrical consumption for 2 years. Materials & Resources: The project diverted 75% of its construction waste from the landfill. The building also contains 16% recycled materials & more than 20% of all the materials used are regionally manufactured. More than 50% of the wood in this project isFSC-certified wood. A comprehensive guided tour narrative is developed for future green building educational opportunities. The Centre achieved exemplary performance in Water Use Reduction, 100%. Indoor Environmental Quality: A high level of air quality was expected both during construction and after completion. The Centre made extensive use of Low VOC products including adhesives, sealants, paints & carpets. Also urea-formaldehyde free millwork was used throughout the building.